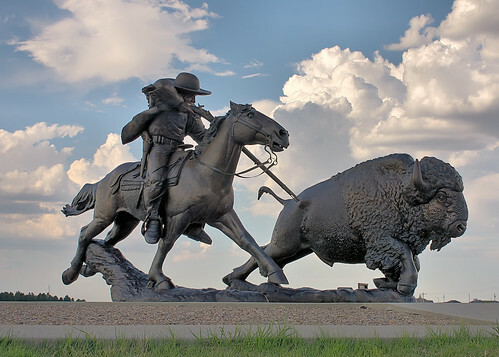 Buffalo Bill, Buffalo Kill by Charlie Norton, Oakley, KS. Image courtesy of meltedplastic on Flickr. On May 28, Governor Sam Brownback confirmed the worst fears of arts advocates in his state and across the country by vetoing the Kansas Arts Commission’s allocation in the state budget. On June 1 the Kansas legislature attempted to override Brownback's veto, but fell short of the two-thirds majority needed. Congratulations, Mr. Brownback on a sad first for your state: first without an arts agency. Read on to find out about the massive ripple effects of this cut, the national response, and even a silver lining. Critics of Mr. Brownback’s veto, including Bob Lynch at Americans for the Arts and Henry Schwaller, the now former chairman of the Kansas Arts Commission, have already pointed out that cutting $689,000 from the state budget will actually cost Kansas more than it saves. The elimination of the arts commission renders Kansas ineligible for $1.2 million in funding from the National Endowment for the Arts and the Mid-America Arts Alliance. Indeed, the total amount is probably much higher, as NEA regrant funds channeled through the Arts Commission as well as Arts Commission grants on their own are often heavily leveraged. So organizations will not only lose out on that funding, but they won’t be able to use it to attract other funders either. This will have an enormous ripple effect on the arts in the state, from organizational programming to Arts in Education programs for K-12 students that were directly supported by the Arts Commission. On the bright Side: "the arts will not roll over"
There is a bit of a silver lining to be found in this terrible situation, and that is the strong advocacy—and strong arts support within the Kansas state government—that has come to light. By vetoing the Arts Commission line item, Governor Brownback is standing alone, countering the wishes of state representatives and the people of Kansas. The Kansas state legislature passed the budget that included the Arts Commission line item, AND tried to override Brownback’s veto. (It’s particularly worth noting that the Arts Commission override was the only override, despite Brownback’s “scorched earth” budget, which included $5.9 million in across-the-board cuts to state agencies.) Brownback may be getting what he wants—but it's not what the state of Kansas wants. It’s heartening that so many in Kansas understand the importance of the Arts Commission (and more broadly, the arts) to their state. Createquity. has an excellent rundown of opinions on the Arts Commission’s demise from across the internet.